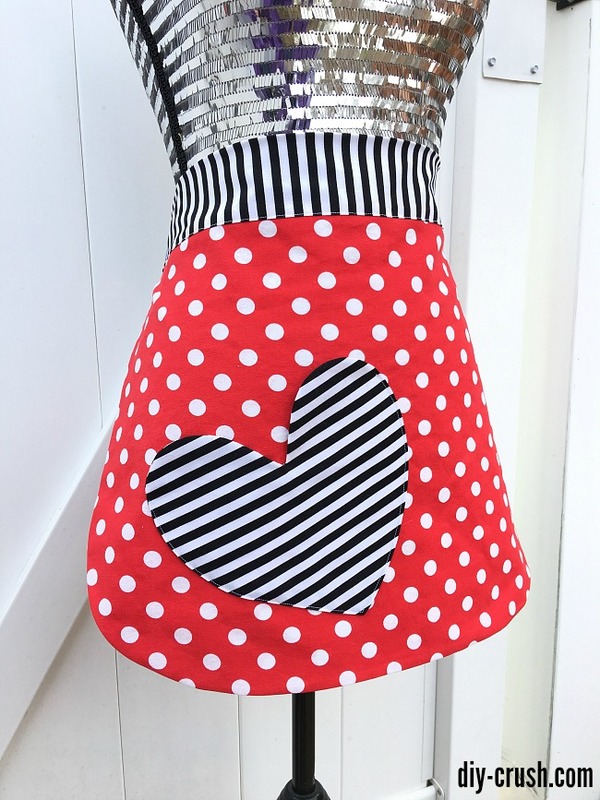 Perfect for cooking, baking or just for serving delicious goodies is this DIY Valentine’s Day apron. 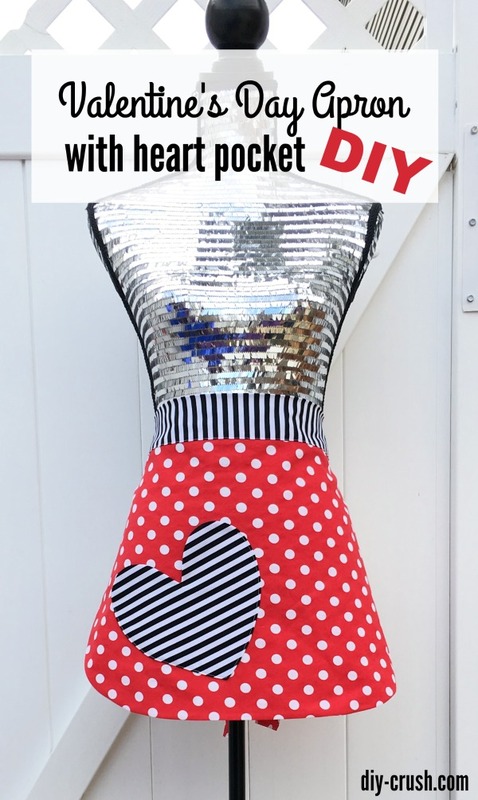 This half apron is really easy to sew and a very beginner could whip this up with no problems. Let me show you how I made this cute apron. Aprons are so easy to make, all you need is a simple pattern or a tutorial without too many steps. When I started sewing I made easy and simple projects and not surprisingly aprons were always one of my very favorite things to sew. Besides, they make beautiful gifts for anyone who loves to cook, bake or just loves aprons. This half apron is made with my “1 hour ’til Mother’s Day” apron pattern. A beautifully simple apron that is reversible. And it really does only take one hour to make. 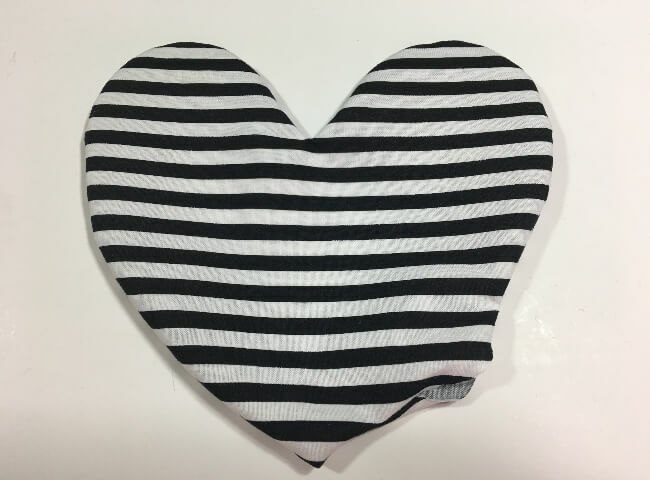 Today’s apron takes a bit longer because it has a cute heart pocket. 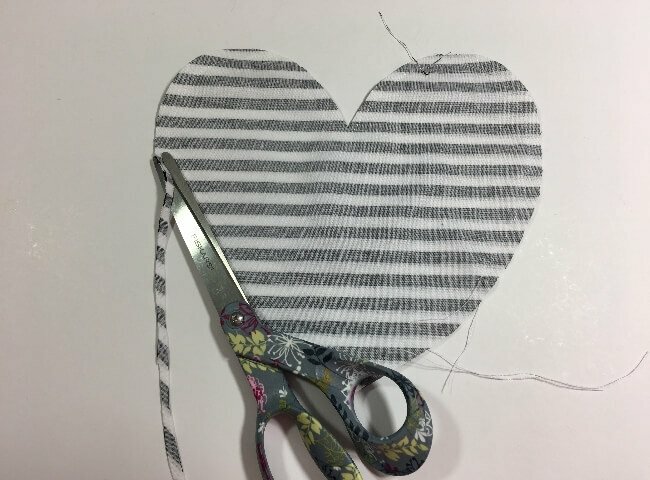 You could stitch the heart on completely if you like but leaving the top open makes a cute and useful pocket. 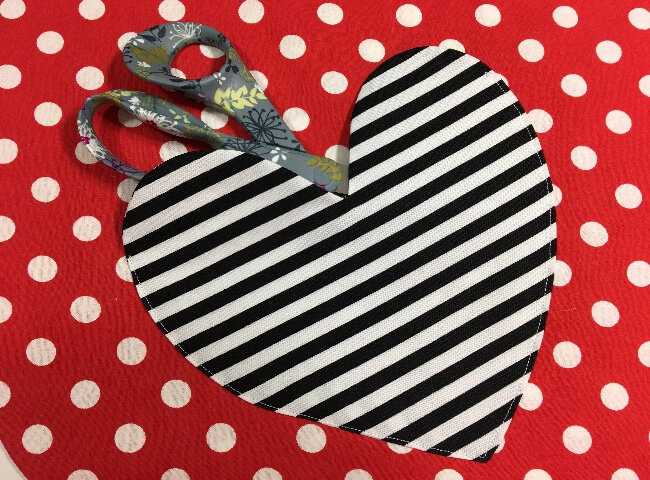 Fold your fabric over (or place two different fabric pieces together) and pin the heart template onto the fabric. 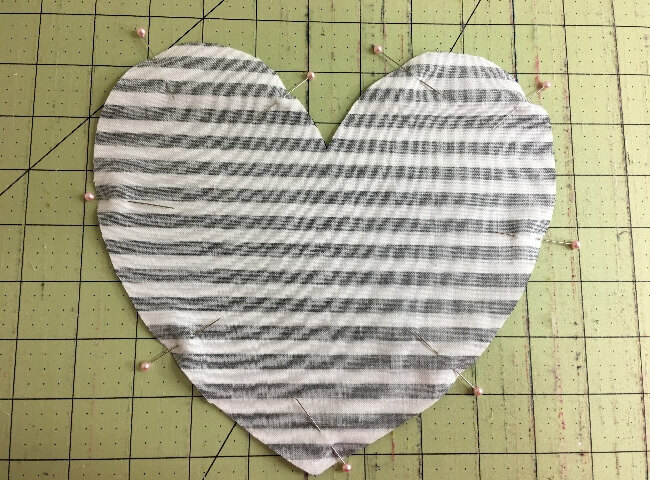 Place the two heart shaped fabric pieces with right sides together and pin, then sew in place with a 1/4″ seam allowance. Leave a 2″ opening on one of the sides. 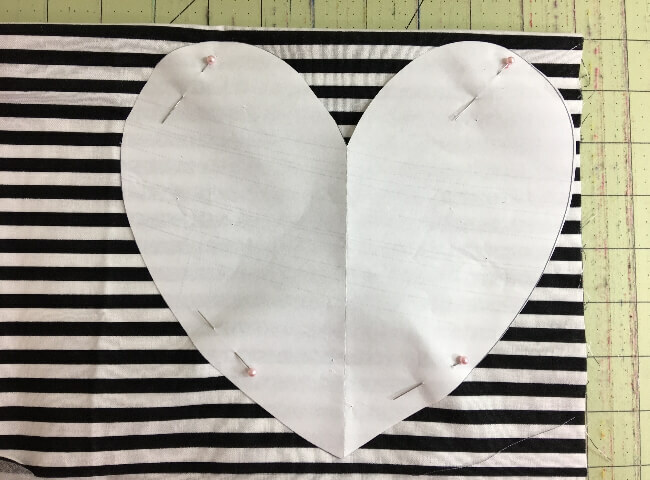 Remove the pins and turn the heart with right sides out. Press the entire heart flat including the opening. For this step you want to have your apron main piece sewn like shown below. 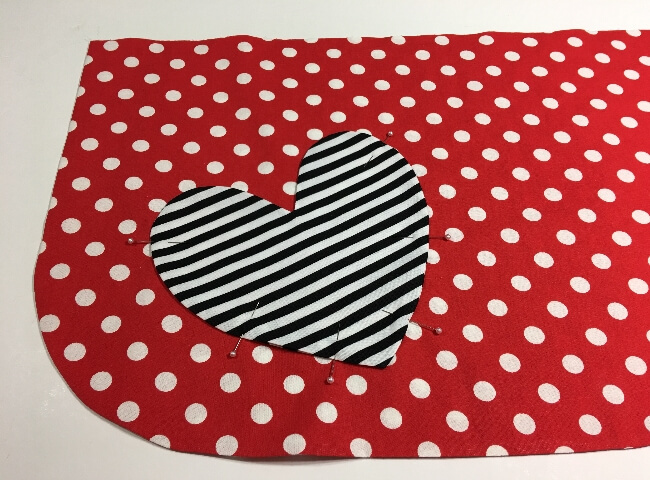 Pin the heart to the apron, I positioned it into the lower portion of the apron’s left side. 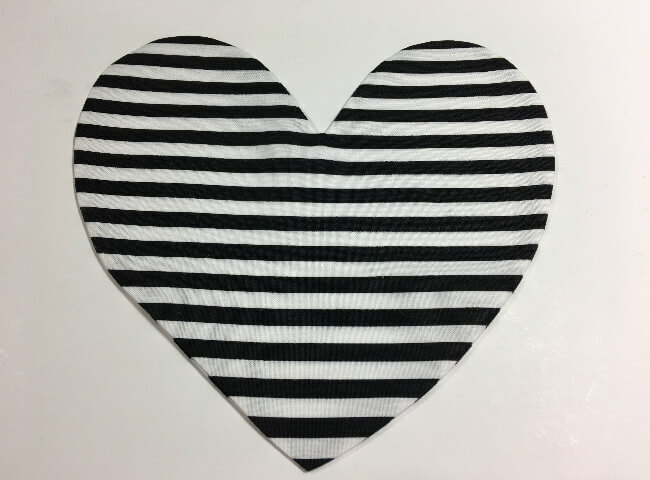 If you like the heart to be a pocket, don’t pin the top portion. Sew the pocket down using a straight stitch and a seam allowance of 1/8″. Start sewing at the right side and backstitch the beginning. Once you reach the other side at the same height as the opposite side, backstitch to finish. Continue sewing the rest of the apron and you are done! For picture demonstration of the pocket I inserted a pair of scissors. And your cute Valentine’s Day half apron is done! I hope you’ll make many more and also in different fabrics for different occasions!